It finally happened for the first time this season— all 23 World Class corps performed head-to-head in the same venue on the same day. 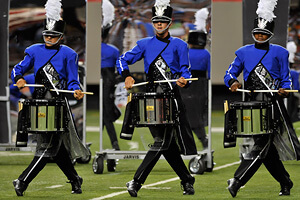 On Saturday, July 31 at the DCI Atlanta Southeastern Championship Presented by Lake Oconee and Greene County, GA at the Georgia Dome, the Blue Devils (1st, 95.65) confidently established themselves as the corps to beat at the World Championship Finals in Indianapolis now less than two weeks away. "Right now we have a huge target on our backs," said Blue Devils Drum Major Andrew Rogers. "It's the same thing as last year. If you're ahead, you know everybody's gunning for you so you just can't let up. We can't let that get to us. Yeah we're ahead, but there's two weeks left. Anything can happen in those two weeks." The Bluecoats (2nd, 93.75) slightly expanded their lead over the Cavaliers (3rd, 93.10), with .65 now standing between them. Carolina Crown (92.55) claimed 4th place, improving on their previous score by two tenths. And though scores have leveled out recently for the Cadets (5th, 91.45), the corps isn't ready to put its soldiers back in the toy chest. "We've been working really hard the last couple of days, and I think we've made great strides in terms of our consistency and our performance," said Drum Major Ben Pouncey. "That really showed up tonight, so hopefully this is going to be a big kind of turning point for us in terms of our consistency and our emotion that we put into each performance." "Toy Souldier" boasts solid all-around quality of the brass, percussion, and color guard sections, their production combining "new school" with "old school." And no matter how the corps places, Pouncey says it's business as usual for the Cadets. "In terms of the competition, we pay attention to it, but we don't let it affect us, and it doesn't affect our day-to-day routine. As [director] George [Hopkins] tells us every day, we just get up each morning and beat our heads against the wall one more time, and we just know that everything will work out in the end." 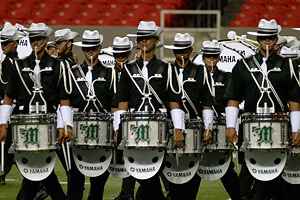 But the main excitement of Saturday's event wasn't just in the top five corps, whose placements remained the same from the previous night in Murfreesboro, Tenn. From sixth place on down, the rest of the World Class corps traded places all through the rankings. Phantom Regiment (6th, 90.00) finally cracked the elusive 90-point mark edging the Santa Clara Vanguard (7th, 89.55) by less than half of a point, a switch in placement from Friday night. The Blue Stars (8th, 88.90), who narrowly missed the opportunity to perform Friday in Murfreesboro, continue to raise the intensity of their 2010 production, "Houdini." Previously black field flats are now decorated with sepia-toned images related to the master artist and his life. Raising their score by more than 1.5 points in the Georgia Dome, the Blue Stars appear to be closing in on the two corps ahead of them. "All of today we were totally on throughout rehearsal," said first-year Blue Stars member David Lee. "We had a great warm-up, and we were all really excited to come into the show and lay one down." Following the Blue Stars were the Boston Crusaders (9th, 86.15), with the Blue Knights (10th, 85.75) looking in. And in an upset from shows earlier this week, the Madison Scouts (11th, 85.55) passed the Glassmen (12th, 84.30), and could potentially challenge Blue Knights for 10th place in the near future. Continuing the lineup in Atlanta, the Academy (13th, 82.60) made a considerable jump in score, passing up both the Colts (14th, 81.80) and the Troopers (15th, 81.60). With Spirit (16th, 79.80) hovering right near 80, these four corps placing 13th-16th now could end up anywhere at the DCI World Championships, and all are keeping a top 12 Finals berth in their sights. "I thought tonight we had an absolutely astounding run," said Spirit Drum Major Alex Swindle. "This is definitely what we were looking for in the return to our home of Atlanta. I'm so glad they support us the way they do." 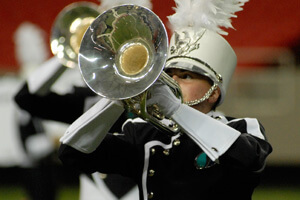 Members of Spirit understand that competition alone is not the only aspect of the drum corps activity people care about. Yet Swindle does not hesitate to spell out the corps' plans for the last weeks of the 2010 tour. "Our competitive goal is, straight-up, [reaching the] Finals. We want to be on that field. But our goal as a corps has nothing to do with where we finish at the end. It's all about making sure everyone here has an experience they can look back on and say, 'That was absolutely the best thing I've ever done in my life.' Not many people in the world that can say that." The Crossmen (17th, 78.50) rounded out Saturday's top 17 World Class corps, less than one point behind Spirit. But West Coast corps Pacific Crest (18th, 77.85) isn't far from 17th which would earn them a spot at the World Championship Semifinals. Taking 19th place was Teal Sound (75.85), and though the score decreased somewhat from a Thursday show in Milton, Fla., the corps is still driving for a spot among the top 17. The Mandarins (20th, 75.15) considerably narrowed the scoring gap between themselves and Teal Sound. The competition among corps outside the top 17 is no less exciting, with Jersey Surf (21st, 72.35) edging the Cascades (22nd, 72.00) by only three-tenths of a point. Jersey Surf rejoined the World Class tour this week after having no competitions between July 6 and 24. During Saturday's event, the New Jersey group drew a good crowd response despite the din of booming thunder and pouring rain outside the Georgia Dome. 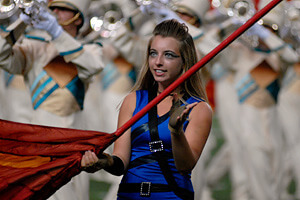 "We've had a couple of recent rehearsal days so it was really great to be back in front of an audience again, especially this big and at a show this big," said color guard captain Stephanie Broadbelt. During the July hiatus from competitive performances, the corps rehearsed on weekends, and it was up to the individual members to carry out the difficult task of retaining what they learned during rehearsals.